Mrs. Pickrell's Technology Adventure | I'm going on a technology adventure! Let's get global! I have just clicked the button to turn in my final paper, of my final grade class…ever! I’ve been in grad school for the last 3 years. I started when I was pregnant with my youngest child, and her 3rd birthday is this weekend. My family has missed me. Has it been worth it? Yes, absolutely! I will now have a Masters degree in not one, but two academic areas. I’m pretty proud of that. Especially being an Alaska Native woman and having the privilege of working with Alaska Native students; I present them with a heck of a role model. So what will I be doing next? First, I need to decondition myself from this ridiculous habit of multi-tasking. Based on necessity for survival, I developed an extreme habit of multi-tasking. I’m a jack of all trades, but the master of none, so to speak. I can’t remember the last time I just sat down and goofed off with my family. There’s always something needing to get done. This will probably be the hardest habit for me to break, but certainly worth the challenge. I’m looking forward to having hobbies again. I’ll just be assigning the homework and grading it from now on. While I am a good student, I’ve been over homework for sometime now. I miss being able to read just for the fun of it. And as far as the future… well I have no idea. The grant for my program where I teach runs out this year. It’s promising that the local school district is considering funding us through the next school year in hopes that we can land another grant. There’s certainly no security in that, but surprisingly I’m at peace with it for the time being. I’ve done the best I can and my students are thriving. I’ve also really enjoyed a chance to reconnect with my cultural roots. I am crazy excited about Never Alone and am going to look seriously into the Cook Inlet Organization and see about getting involved with more educational gaming and creating culturally Alaskan games. This has been an amazing journey. I’ve met some incredible people and really pushed myself further than I ever expected. The greatest thing about it, is while I may be closing this one chapter of my life, the adventure isn’t quite over. There’s so much out there to try, explore, and conquer. Game on, everyone! Enjoy the adventure! BTW– “Zombies, Run!” is one of the most incurable games I have ever played. If you hate working out, I HIGHLY recommend this game! This is a segment from my final paper of my final grad school class. I suppose the hardest part to deal with besides the amount of time committed to pulling off this ginormous project was the feeling of not being heard. In my own small way, I can shoot my thoughts off into cyberspace and perhaps be validated in some way. Or maybe not. The point is, I’m did the best I possibly could, and I have no regrets about that. Create more instructional videos for teachers. In this day and age, when we have the ability to pad our schedules down to the minutes, teachers have very little time to read through instructions. It doesn’t fit with the NetGener understanding. We don’t read instructions. We jump in and figure things out. However, when you are looking for a specific outcome or product, this idea will become lost in lengthy, written instructions. For our experience, 3 pages of instructions were created. This is on top of written lesson plans and rubrics. Granted, we the game developers did our part and made the information available. However, as coaches, we weren’t conducive to the teachers’ time—especially for a game. A series of quick videos would have streamlined this process. Not only would this have made the process more easily implemented, but it also would eliminate the anonymity of the game developers. We are people too. We are not faceless. We have feelings just like the students, and therefore, are worthy of respect as if we were within the same classroom of the students. Create a Google Community as opposed to a Google Group for coordination. There were far too many emails in this process. On top of reading through lengthy instructions, the teachers were constantly inundated with mass emails. As a developer AND a teacher, I had double the load. Information easily got lost. However, in a Google Community, like Facebook, I would have easily been able to find a specific thread and followed the comments and information pertaining to said thread. It bogs down the communication much less. Among the game developers, there must be transparency of information, and never assume that you understand what someone else is saying and take action—explain it back to them to make sure. This impulsiveness happened a lot during this process, and I felt so disrespected. It was extremely frustrating! I don’t believe that it was too much a generational thing, because I wasn’t that far in age to a lot of my peers. But I did sense a lack of listening. Had we been sitting in the same classroom, my peers would have easily been able to read my body language. Online, there isn’t always that luxury. Speaking one at a time like a walky-talky and not always being “done up” so that you can stand looking at yourself on the webcam eliminated a lot of social cues. Many times, I would explain my understanding of a situation and sometimes solutions. We would come to a consensus. Then, when we would next meet, I would find that the plan had changed and it was nothing that I thought we had talked about. Again, extremely frustrating with a sense of disrespect—we didn’t respect you enough to fully listen. I know NO ONE in this group ever meant it that way! But especially near the end, when this kept happening, I had to coach myself that misunderstanding was not the same as disrespect or ingratitude. I was very quite at the beginning of this project, because I was getting a feel for people and I didn’t want to just bulldoze my way through. As my frustrations mounted near the end, and I started to step forward to make myself heard, especially since we were running out of time, I sensed that people were taking more of an offense at my abruptness. I was suddenly the Debby-downer. And that’s probably a good assessment. I got very burned out just trying to do what should have been the simple things. But there was very little consideration as to how I got that way. A good coach does very little of the talking. They ask, “Why?” and listen, more than anything. Keep the game simple. It may be chaotic, but that’s the students we’re teaching. THEY are chaotic. They are unique. And they love it that way. By instituting less restrictions and boundaries, we are allowing the experience to be more student-led. Scenario 1 was so rigid in its emergence, and granted, a lot of classrooms didn’t appear properly prepared for the experience. We, the game developers and monitors, did way too much policing. That should never be the case. It should be low cost to the teachers, higher cost to the students. That’s teaching 101. Also, for personal well-being, the creation of the game itself should be simple. No one appreciates the necessary step of “experience grinding.” “Experience grinding” is the tedious task, often seen in RPG’s, where you walk around and kill monsters in order to gain enough experience to level up or get gold. It’s boring! In Minecraft development, my “experience grinding” was flattening and discoloring zones. It was a long, tedious process… and looked like nothing. It even sounds unimpressive. “What did you do in the game?” “I created giant gaps and took the color out.” Right. You sound like someone who knows what they’re doing. Was it necessary? According to the group planning, yes. But don’t be looking for any pats on the back. And the students are just going to completely destroy what took you so long to create—because you created it for them. So future game builders, develop a thicker skin than myself and be okay with the ultimate demise of your hard work. Encourage education of digital citizenship. This experience very much brought to mind Jason Ohler’s teachings on digital citizenship. Unsupervised adolescents online will crush your soul! And there’s a reason for this. These students often don’t feel secure in themselves, but the anonymity online makes them bold. This boldness and sense of superiority can make them mean. Not all, but enough to ruin an experience for everyone. Within schools, there needs to be a move to educate students how to navigate the Internet safely and how to properly contribute to a global society. This type of activity is a great practice ground, but as game developers and monitors, we need to coach teachers in how to go about doing this. We don’t just give teens the key to the car because they can drive the vehicle. We ride along with them to make sure they learn the rules of the road too. If you don’t, people get hurt. The exact same idea applies online. More teacher coaching is needed. In the explosion of this project, one of our main purposes got lost. There just wasn’t time for it, and the project grew so big that there was no possible to way to build rapport with teachers. Writing instruction manuals doesn’t accomplish this. Making videos doesn’t accomplish this. It would have been nice, especially with teachers who weren’t comfortable with the tech but were still willing to try, if we could have been better aides in developing their understanding and building their confidence. To help them see the value of gaming in the classroom, so that they could have another tool to engage their students in their own way. Partnering with the students is valuable. Too often the idea of reciprocal teaching is neglected. Students have so much to share with us! And they really do stay more on task when they feel they are genuine, contributing members. During the course of the experience, students I ran into who were chronic “trouble makers” often turned into valuable partners when they had something they could do to help. Could they help teach someone else who was struggling? Could they build something I didn’t have time to assemble? Would their actions reflect favorably on gaming and help institute regular gaming in the classroom? In one incident during Scenario 2, a number of students from the same class kept saying, “We don’t know what we’re supposed to do!” I asked them if they had seen the instructional video I created. They said they hadn’t. I gave them a quick summary of the objective, and then directed them to respectfully ask their teacher to share the video with them. The next day, I came across the same students and they said, “Hey AdminTiffany! We saw you in the video! It really helped!” Student partners can be extremely helpful in accomplishing what you set out to do. Teachers working within same zones should collaborate together. I wish I had implemented this with my class, but I just ran out of time and thought capacity. I did hear that other teachers planned together and came up with a beautiful layout for their Community. Teachers working together, knowing what to expect from each other and their students, would go far to reduce frustrations. My students were prepared to work potentially with students who were much younger than themselves. However, those other students didn’t even respond to their requests for cooperation. I believe that if I had contacted the other teachers it would have been a much more collaborative experience. Partner with teachers as monitors. I know that there are already plans to make this happen, and I am glad for it. We’re not babysitters—we’re grad students. We are here to work with teachers. But if the teachers aren’t there to work with, there’s very little we can do to stem the tide of adolescent angst. Be aware of the time frame. We implemented this around Thanksgiving and into the beginning of December. This is the most crazy holiday season. Not that we had much choice, based on when our semester took place, but it really did add to the chaos. We were also the trailblazers, so for upcoming classes who will be creating something new, they won’t have the same challenges we’ve already endured. Also, establishing a secure enough system so that students can game in their own time would be helpful. 5 hours of Minecraft a week is nothing at all in the gaming world. If they are really engaged, they will want more. And if gaming is taking place at home, more writing and academics can take place during the limited school time. Limiting the number of students will aide to this security too. Within 4 days of advertising, we had 2000+ students trying to register for this event. That’s way too many. Set a cap, and stick with it. You can expand as you get more secure with yourself. We’re grad students first, game developers second. Again, we’ve never done this before. We just didn’t know what to expect. But there was a time when I completely forgot what I was doing this for. I’m glad I had the experience. I’ve always wanted to get into game development. But game developers spend a majority of their time doing their job. We still had work, family lives, blogging, literature reviews, and everything else. It just turned into too much. I know some of my peers were in a much more strenuous situations than I was. Not to mention, game developers generally get paid, because game developing is their job. However, the fact that our names were associated with this project pushed us to not want to create an inferior product—especially since it was going out to the global community. So that meant long, extra hours that we took away from our families… for… pride? It sounds harsh, but that is kind of what it boils down to. I bought my entire family the “I survived Givercraft,” shirts because they did. They survived crazy mommy spending tons of time so that she felt like she fully contributed to a game for others. This project needs to be near the end of the program. There are so many facets called for in this type of project that grad students should be prepared for before they start this. I would recommend that this type of class only be offered to those who are near the end of their Ed. Tech degree. This calls for leadership skills (coaching), digital citizenship, and a familiarity with working with various tech. I was originally part of a second team that was going to create a different game. However, my 2 groupmates dropped out of the class. It could be for other reasons, but I do know that at least one person was extremely intimidated by the tech. Time is just falling into some kind of crazy vortex. I’m getting to the point where I can’t even tell time any more. While I am very happy that this project is going well, I will be even more ecstatic when it’s over. This week I’ve been getting the rest of my ducks in a row. I got my students set up with wikispaces; we changed the IP addresses; and got usernames established. I did have a rather interesting incident. I went over the Greifing agreement with my students. Some of them were already planning on building traps and other magnificent creations. However, when I explained to them exactly how the game was to go and how they would be graded, I caught their attention. When I told them that this project was a big deal because so many in the educational community would be watching, they became partners. I explained that because they were high schoolers, I would be expecting them to be mature, helpful, and tactful. When we re-entered the Givercraft world, we were initially in Zone 10. However, due to registration changes, I knew we were no longer going to be in that zone. I had instructed them all to go to my specifically created test zone. However, I began hearing comments, “Hmmm… I see color. I must fix this.” …. …. …. … I REALLY wished I had partnered with them months ago! We could have cranked out those zones in no time! I was very impressed that my students went from showing off their initial prowess to readying themselves to be teachers and partners. So I am looking forward to FINALLY playing the game with my students this week. It’s going to be an great experience, and I’m really interested to see the results. I’m writing this a little late, because my Sunday was CRAZY!!! I have the great honor of escorting my awesome students to the Elders & Youth Conference as well as AFN. We got in late last night. Then we’ve had meeting after meeting. There has been very little time for anything else! In reflection of this last week, it has been a growing experience. What started as a simple homework operating session turned into an enormous expansion of my Professional Learning Network! I am really excited about working with people from literally all over the globe on this project! Even though this didn’t happen this week, I did want to share this uber-cool moment today. 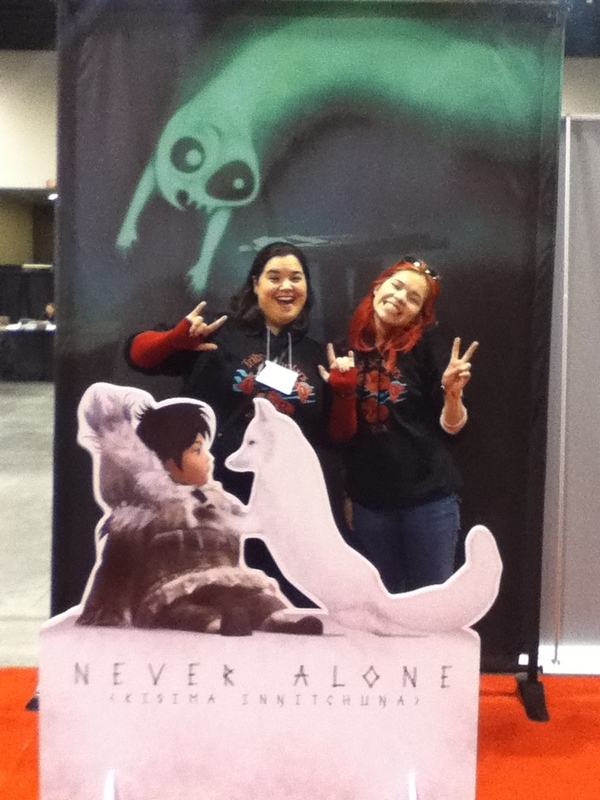 At the expo here at the Elders and Youth conference had a demo for “Never Alone,” a video game that depicts Inupiaq culture as a mainstream video game. I am blown away by this game! It’s beautiful; prioritizes problem-solving over violence; and is narrated in Native Inupiaq language! As I’m listening to Elders bemoan the loss of their languages, I just see so much promise in a game like this! I told the developers I couldn’t wait to see a Southeast version of this game! They said they’ve been asked a lot about sequels already. But of course, this game needed to be successful first. So I am passing it around my PLN! This is a GREAT game!!! Please share and get a conversation going around it! This could be a modern means of preserving Native cultures that are fading away! Possibly even revitalizing it! Gotta strike that perfect balance! This week has been full of game designing– both lesson plan wise and also within the actual game of Minecraftedu. I will say, that picking up Worldedit again has been crazy fun! Yes, so what if I sing “Let it Go” as I cover the Minecraft-scape with snow! It’s cool! (See what I did there? *tee hee*) Developing the actual game for our module has been tasking and it has given me a greater appreciation for those who actually develop games. It takes me hours to reformat something that someone else has already created. So the next time I play a game that I beat within 20 hours, I’m not going to complain; because it probably took the developers months (maybe years) to develop that game time! However, I firmly believe that putting the time into developing is well worth the effort, as the modern student is used to a particular quality within their game. If I put a half-effort into my creation, they will model that same level of effort. I want the most out of my students. The lesson planning themselves have also been interesting in their development. This is my first time working, what is essentially, a full-time job and doing grad school. I have nothing but respect for those who have been doing this all the long! We’ve been utilizing an emailing system to communicate across our development group. However, I’m finding that by the time I get off work and can actually turn my grad student brain on, I have about 15 emails to work my way through. Things get jumbled, or even lost, and I feel like I’ve let my team down because I’m not as on top of it all as I like to be. However, things are coming together; and I’m very proud of the hard work that the rest of my team is putting into this project. I’ve been modifying the Task for our second week of this module, making sure that it has a solid link to a Common Core Standard. 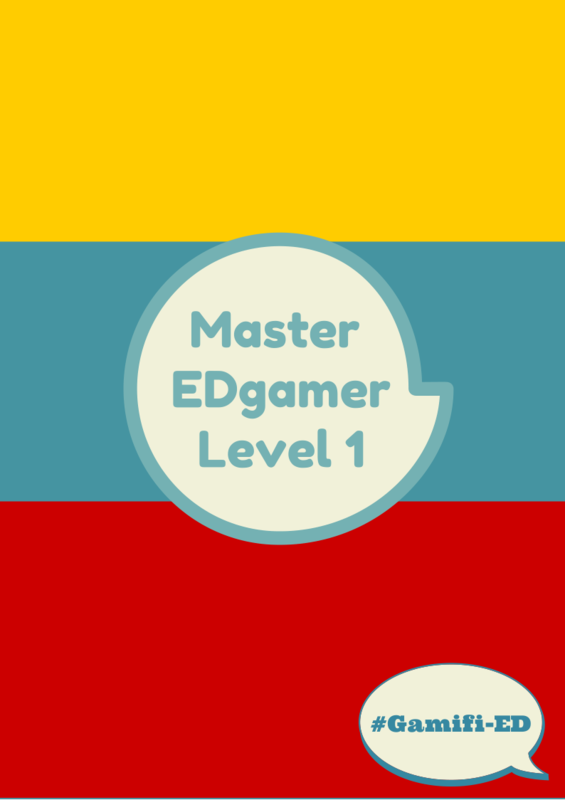 The biggest challenge in the course is making sure that the task captures the main components of gamification. Is the task challenging enough, yet obtainable? Does it allow for an experience of consequences without real-life ramifications? Will it be engaging? Does it lead the students to the mastery of the objective, or is it just busy work? I feel that we’re just about there, and it’s exciting! Speaking of excitement, I’m really looking forward to how this GiverCraft Language expansion is going to turn out. If all goes as planned, we will have Literacy students learning some Japanese words from Language students. And, in tandem, Language students teaching Japanese words to Literacy students. I’m a strong believer in that you learn better when you teach something. With students crossing Minecraft cultures and trading, I think we present a unique environment for this learning to take place. Fingers crossed!